Don’t let your work grind to a halt with a bent airbrush needle - SharpenAir™ delivers when you need it most. Keeping your projects on schedule is an important part of keeping customers happy. This tool is designed to get you back up and running in the case of an emergency. We will always recommend purchasing a brand new needle for the best performance. Everyone bends an airbrush needle at some point, and usually at the worst possible moment, with no spare needle at the ready. Technical issues have a habit of popping up when the pressure is on, bent needles bring everything to a grinding halt, or worse still ruin the stage of the project you are working on. With SharpenAir™ you can restore even badly bent needles, getting you back to painting and meeting those deadlines. The Original SharpenAir™ model works with ALL airbrush brands EXCEPT Paasche and DeVilbiss Dagr - Paasche/DeVilbiss users will need the Paasche Model. SharpenAir™ is the first and only hand-held device that is designed specifically for repairing bent and damaged airbrush fluid needles. The concept and design was created by Chad Elliott, an airbrush artist, especially for the airbrushing community. SharpenAir™ works by utilizing multiple angles allowing your damaged needle to be straightened efficiently and with precision each and every time while maintaining its factory angle. There are four runners located at the bottom of each SharpenAir™ which are uniquely angled to do the work for you. At the end of each runner is a diamond-grit coated sharpening stone. These stones are made up of varying grit and work together to provide you with a consistently perfect finish. Includes Polishing Pad. 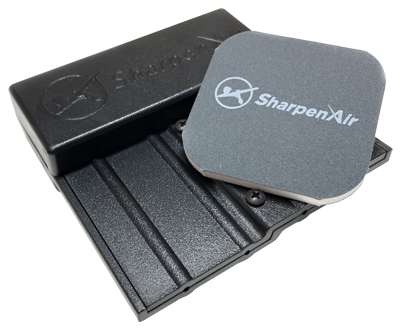 SharpenAir™ boasts a sleek design with a matte black finish and smooth embossed logo located on the front face. Runners located at the bottom of the tool allow for easy needle insertion and sharpening. The Original SharpenAir™ model is also available in Limited Edition pink. Replacement stones and polishing pads are available on our website. Click Here to visit the SharpenAir™ YouTube Channel for Instructional Videos. 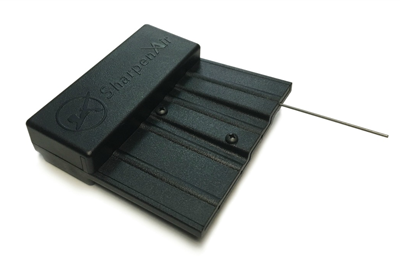 SharpenAir™ is a hand-held tool designed to repair bent and damaged airbrush fluid needles. The design is compact and easy-to-use. 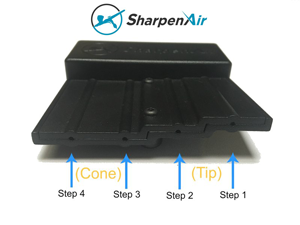 SharpenAir™ utilizes multiple angles allowing your damaged needle to be straightened precisely and correctly each and every time while maintaining its factory angle. There are four runners located at the bottom of each SharpenAir™ which are uniquely angled to do the work for you. At the end of each runner is a diamond-grit coated sharpening stone. These stones are made up of varying grit and work together to provide you with a consistently perfect finish. How long does the sharpening process take? The process typically takes 1-5 minutes depending on the severity of the bend in your needle. Is it compatible with multiple needle sizes and brands? Yes. SharpenAir™ Original was designed to work as a universal tool. It is compatible with most fluid needle sizes and brands. However, we have a Paasche Model that accommodates the Paasche and DeVilbiss Dagr due to needle shaft thickness. Through research SharpenAir™ discovered that most needles, no matter the size, were ground at the same angle. The difference in needle sizes is attributed to the length of the cone rather than the angle at which it is made. SharpenAir™ controls the angle while it sharpens allowing you to efficiently and effortlessly correct bent needles. How can SharpenAir™ save me money? By using SharpenAir™, we give you the ability to extend the life of your airbrush needles. SharpenAir™ will not only save you money, but will save you time as well. Keeping your projects on schedule is an important part of keeping customers happy. This tool delivers when you need it most. What is the life-span of SharpenAir™? This product is made with high-quality materials to enhance durability and function. The design also allows users to get the most use out of every component. Each sharpening stone can be manipulated and re-seated to use the maximum amount of surface area. We also sell replacement stones on our website.